In general, when traveling a long distance, I attempt to arrive a day early to have time to rejuvenate. When I arrived at the train station in Wolfsburg, I was whisked away in the limo to The Ritz-Carlton, Wolfsburg. One of my first goals was to make a spa appointment for a signature treatment, as that is always relaxing and refreshing. Once that was scheduled for early the following morning, I was able to enjoy high tea and then take an long nap before dinner in the hotel’s Michelin 3-star restaurant. 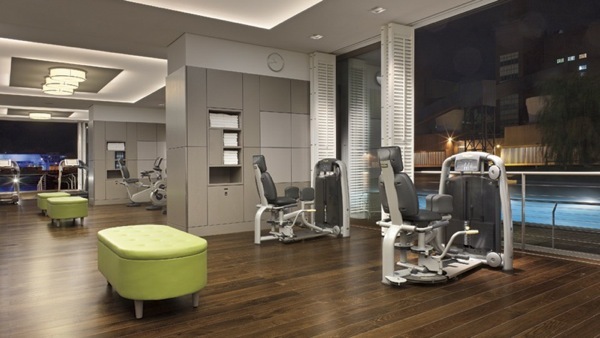 After a wonderful night’s sleep, I checked out the exercise room for an hour before I started my indulgence. 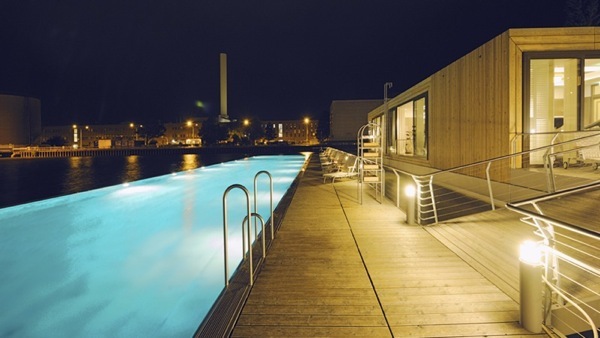 A well-equipped modern workout facility was offered, with windows that provided a view of the docks, canal, the VW power plant, and one of the spa’s most famous aspects, its floating pool in the harbor basin. This floating pool maintained a constant temperature of 29 C/84F. 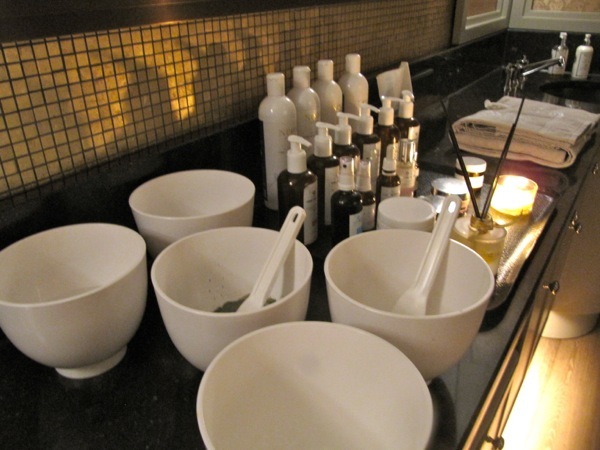 Upon arriving at the peaceful, solitude of The Ritz-Carlton Spa, I enjoyed its relaxing atmosphere. 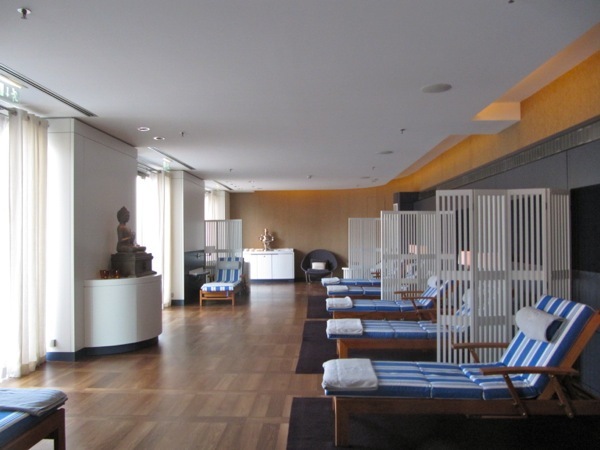 The spa offered two steam rooms and two saunas, separated by a men and women’s section. I went on to my treatment and highlight of my visit—“Renew Rose Anti-Aging Body Ritual,” for 90 minutes of delight. My therapist started with a fine regenerating body polish, during which she dry brushed my body all over. A mud packaging followed this. While allowing the mud to dry, the therapist massaged my feet—sheer heaven. After the mud dried, I showered it off and then returned to the massage table, for a body massage with pure rose jasmine oil. This was known for calming your skin and pores before the Collagen-rebuilding Rose Plus Anti-Ageing body cream was applied. Since my service was early in the day, I took time to enjoy the relaxation room. After enjoying some warm tea while looking out at the floating pool, my mind floated away and I slept for 45 minutes. It was sheer relaxation. Before I left, I learned about The Organic Pharmacy products used. They were exceptional. The spa offers massages, body treatments, and facials. So, you are able to schedule whatever you desire. Not all spas offer a four hands massage. Ritz-Carlton, Wolfsburg Spa does, and I know for a fact, this treatment is delightful and a massage you will never forget. Another extremely important aspect focuses on therapists. They enjoy the facility so much that its turnover is minimal. Most have been there since inception. This provides continuity of teamwork, which was evident in my treatment. This is a spa that I felt offers exceptional services for a fair charge. I walked away, knowing I had achieved my goal of being alert and ready to start my whirlwind business schedule that afternoon. This hotel has many not-to-miss activities and services. Its spa is just one, but is certainly one not to be missed. If you are going to Wolfsburg to pick up a VW, you may want to make your spa appointment ahead of time. Photos are courtesy of The Ritz-Carlton Wolfsburg.